Arigna Natural Gardens » Arigna versus Varanasi! 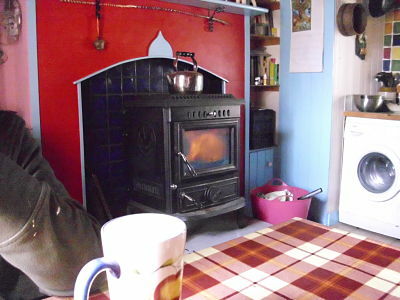 Our lovely stove in our kitchen. Tis solid fuel, we got rid of oil 3 Years ago. It heats 8 radiators and keeps the house nice n toasty. We have it going every day due to the downward spiral of the Irish weather. Infact, only the funeral pyres in Varanasi (India), have been burning for longer!. From a wet and windy Arigna.